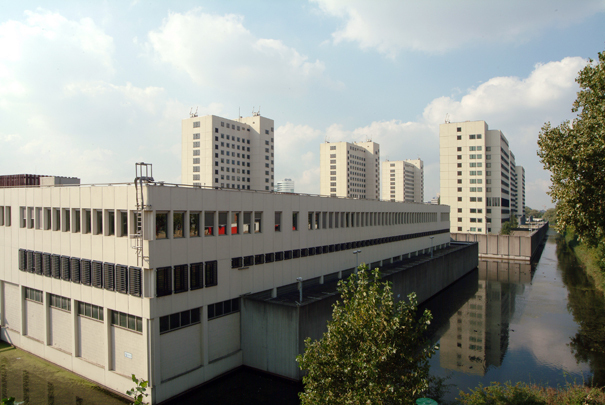 Extending from the rectangular main building of this penitentiary complex, known as the Bijlmerbajes (Bijlmer 'Nick') is a 250 m. long central corridor linking six blocks: four of ten storeys for men, one tall block for women and another for observation, counselling and sick bays. These blocks connect via a low-rise section of workshops with the five metre high surrounding wall. Between the blocks are sportsfields and gardens to walk in. The prison is no longer in use since July 2017. One tower will be transformed to a "green tower" with parks and urban agriculture; the other towers will be demolished and replaced by a new residential quarter with 1350 houses.